Hi everyone! It just occurred to me the other day that not everyone knows how to peel garlic cloves from a head of garlic. And seeing as though I love garlic, and I’m sure you do, too, I figured I should let you in on the secret. 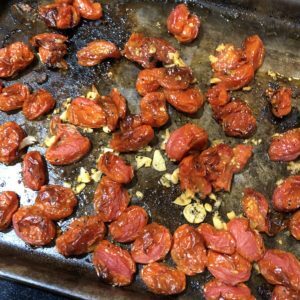 So…here’s a short video on how to peel garlic cloves, followed by the Roasted Tomatoes with Garlic recipe that I used those delicious slices of garlic for. And here’s the recipe for the Roasted Tomatoes and Garlic along with the picture that I promised in the video. I have to say, these are AH-MAAA-ZIIING!! Seriously, they’re like candy. Healthy candy filled with antioxidants. Honestly…I had to put them away or I was going to eat the entire thing.